AUT Series trailers are versatile workhorses, designed to haul just about anything that a project at home or a day at work entails. Each model’s extruded aluminum deck offers tie down points that run the full length of the deck. Choose from a wide range of AUT sizes to suit your hauling needs. Take a look at some additional features below, and be sure to request a quote from your dealer when you find the model you’re looking for. Fully Welded Frame and Deck: The Triton difference – all-aluminum, fully welded frame provides a solid structure for years of loading and unloading. Frame and decking are fixture-built with custom extrusions, providing added strength with Triton fit and finish. Tongue Design: Durable, fully welded A-frame tongue adds strength to the frame for multi-purpose towing. 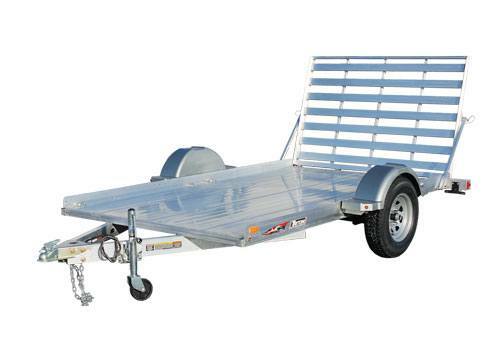 Models AUT853, AUT864, AUT1064 have a dropped tongue, providing a lower deck height and ramp angle for ease of towing, loading and unloading. Torsion Axle: Independent suspension with four cord rubber torsion axle provides a smooth ride. Rear Loading Options: Aluminum straight ramp and optional bi-fold ramp are fully welded with aluminum hinges, providing superior support across the entire ramp. Optional bi-fold ramp creates a low-profile presence on the road for less wind drag and improved gas mileage. Tough Molded Fenders: Fenders with integral molded steps provide step points to access and tie down machines or cargo. Without Brakes - 2,435 lbs. With Brakes - 2,940 lbs.